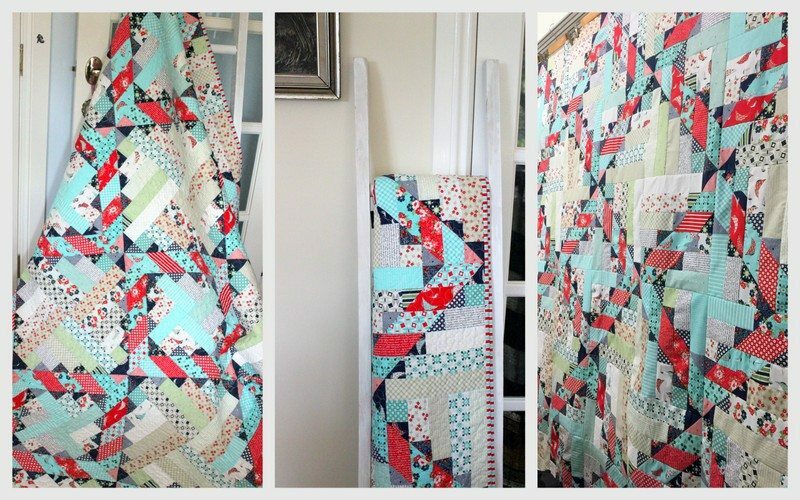 I wanted to make a quilt using 2 1/2″ strips in a combination of low volume background prints and my favourite colours – turquoise, red and navy. 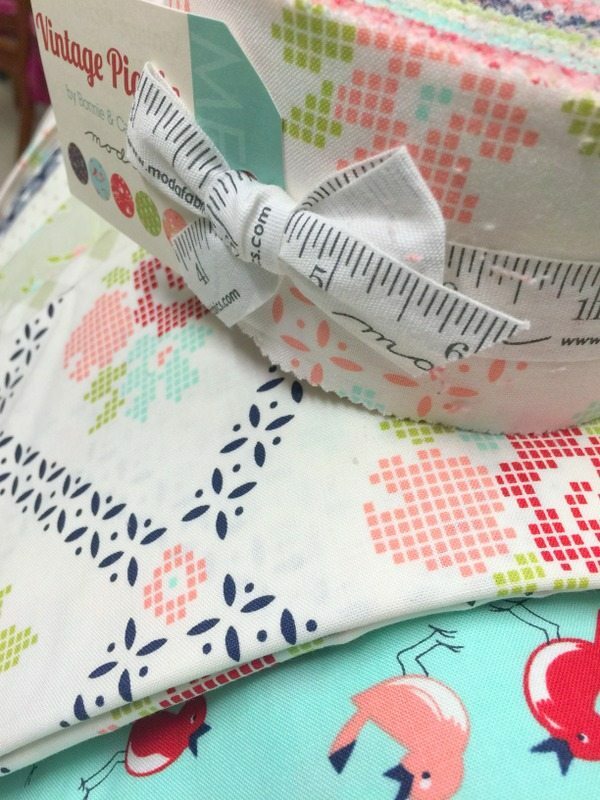 What could be more perfect than a FQ bundle of Daysail by Bonnie and Camille for Moda? It was sitting in my Moda Shrine (cupboard I keep all my Moda pre-cuts) calling out to me, “use me, use me”. I have not been able to do much sewing of late. Too many exciting projects going on which fill my days (more on that later). I really needed to sew and get this baby finished as I started it before Spring market. Calling on my lovely friend Tania, we put the quilt top together in one day. We make a great team. I sew while Tania cuts, presses, pins and throws pieces at me. A very delightful and entertaining day of sewing. Quilted with Aurifil cotton 50wt thread in 2021 with an all over daisy design. Bound in the Daysail turquoise, red and white stripe and backed in the white sail boats, this 72″x 72″ lap sized quilt will become a pattern. 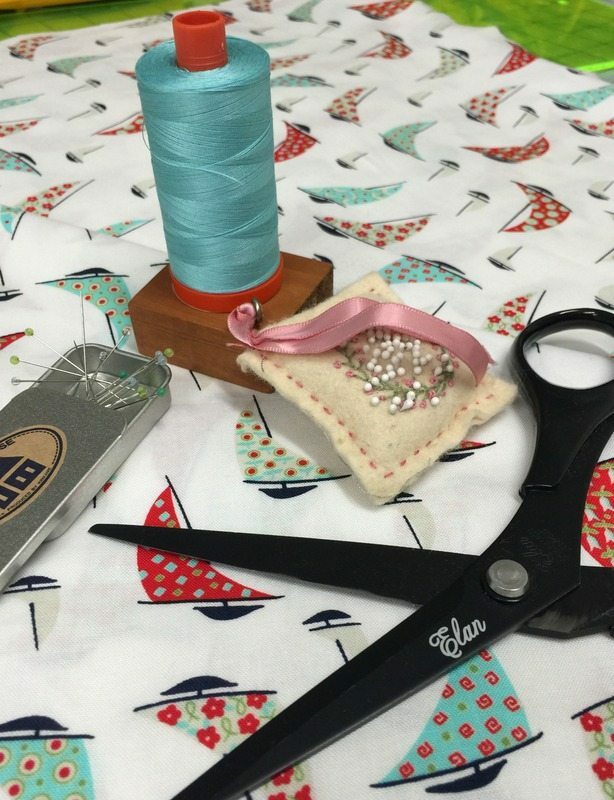 Next on the cutting table is a quilt called Summer Picnic made with Vintage Picnic by Bonnie and Camille. You can see the previews of this new collection and all the wonderful new patterns at Thimble Blossoms FB page. Thank you Lynne. I love Scrumptious too. Thank you. It will work with JR strips but you will need plenty of low volume prints for the background.